By now hopefully you’ve heard the good news that we’ve added first class support for building and running .NET applications inside of Docker containers in Visual Studio 2017 RC. 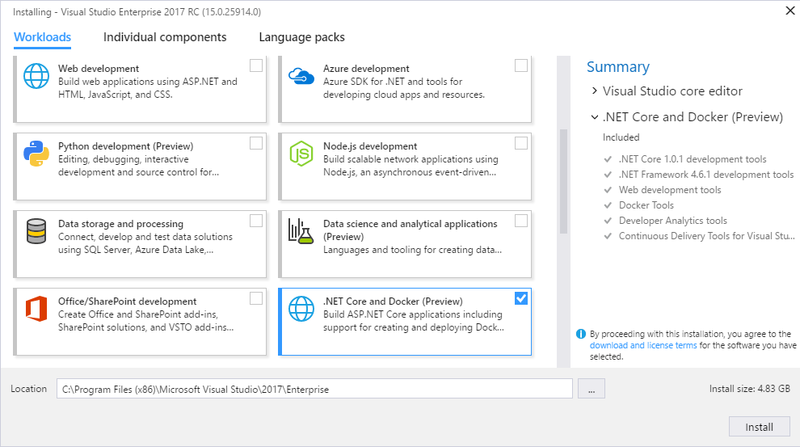 Visual Studio 2017 and Docker support building and running .NET applications using Windows containers (on Windows 10/Server 2016 only), and .NET Core applications on Linux containers, including the ability to publish and run Linux containers on Microsoft’s Azure App Service. Docker containers package an application with everything it needs to run: code, runtime, system tools, system libraries – anything you would install on a server. Put simply, a container is an isolated place where an application can run without affecting the rest of the system, and without the system affecting the application. This makes them an ideal way to package and run applications in production environments, where historically constraints imposed by the production environment (e.g. which version of the .NET runtime the server is running) have dictated development decisions. Additionally, Docker containers are very lightweight which enable scaling applications quickly by spinning up new instances. 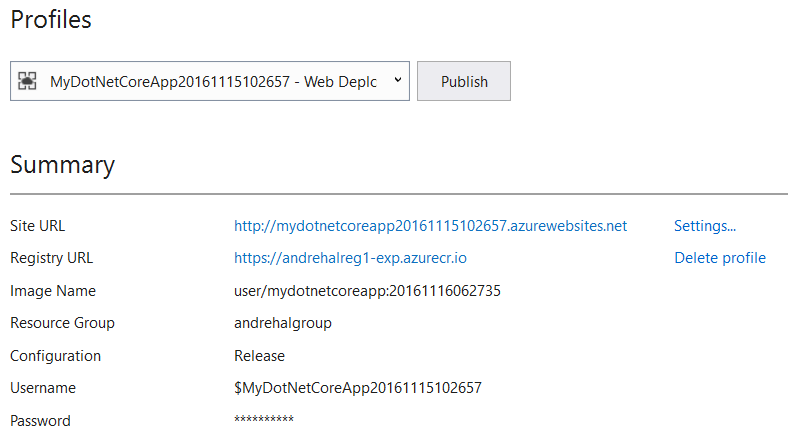 In this post, I’ll focus on creating a .NET Core application, publishing it to the Azure App Service Linux Preview and setting up continuous build integration and delivery to the Azure Container Service. Once it finishes installing, you’ll need to install Docker for Windows (if you want to use Windows containers on Windows 10 or Server 2016 you’ll need the Beta channel and the Windows 10 Anniversary Edition, if you want Linux containers you can choose either the Stable or Beta channel installers). Now that Visual Studio and Docker are installed and configured properly let’s create a .NET Core application that we’ll run in a Linux container. On the ASP.NET application dialog, there is a checkbox that allows us to add Docker support to the application as part of project creation. For now, we’ll to skip this, so we can see how to add Docker support existing applications. Next, we’ll hit Ctrl + F5 to run it inside IIS Express, we can see we’re running on Windows as we would expect. Now, to add Docker support to the application, right click on the project in Solution Explorer, choose Add, and then “Docker Project Support” (use “Docker Solution Support” to create containers for multiple projects). You’ll see that the “Start” button has changed to say “Docker” and several Docker files have been added to the project. Let’s hit Ctrl+F5 again and we can see that the app is now running inside a Linux container locally. Now let’s publish the app to Microsoft Azure App Service, which now offers the ability to run Linux Docker containers in a preview form. At any time, you can push a new image to the container registry which will then result in the copy running in App Service being updated. When we click “OK” it will take about a minute, and then we’ll return to the “Publish” page, where we’ll see a summary of the publish profile we just created. When the application is ready, your browser will open to the site, and we can see that we’re running on Linux in Azure! Now let’s setup continuous build delivery to Microsoft Azure Container Service. To do this, I’ll right click on the project and choose “Configure Continuous Delivery…”. This will bring up a continuous delivery configuration dialog. 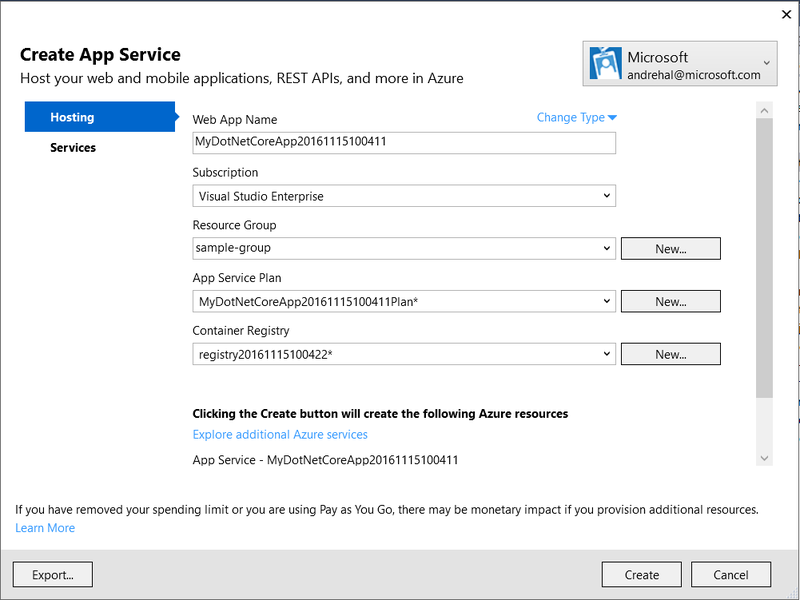 On the Configure Continuous Delivery dialog, select a user account with a valid Azure subscription as well as An Azure subscription with a valid Container registry and a DC/OC orchestrator Azure Container Service. When done, click OK to start the setup process. A dialog will pop-up to explain that the setup process started. As the continuous build delivery setup can take several minutes to complete, you may consult the ‘Continuous Delivery Tools’ output tool window later to inspect the progress. Upon successful completion of the setup, the output window will display the configuration details used to create the build and release definitions on VSTS to enable continuous build delivery for the project to the Azure Container Service. Please download Visual Studio 2017 today, and give our .NET Core and Docker experience a try. It’s worth noting that this is a preview of the experience, so please help us make it great by providing feedback in the comments below. A typical Azure user on an AAD-joined machine will get a failure when trying to share their drive due to the lack of support for this scenario. 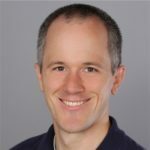 Since this article is linked from https://github.com/Microsoft/DockerTools and, therefore, is an entry point for those who want to learn about setting it up, it would be good to mention that limitation, along with a link to a workaround.